1. Strength – With Fibrex, our casement windows in St. Charles, MO, can st and strong against any weather conditions. It will not flake, rust, pit, or corrode. Due to its strength, we can make narrower frames and sashes. This means you can have room for larger glass area for your windows. 2. Low maintenance – Fibrex frames help save money on maintenance or cleaning costs because they don’t need scraping or painting. 3. Environmental responsibility – We do our share to save the environment by using eco-friendly materials for our windows. Fibrex has 40% reclaimed wood fiber by weight. We can also reground and reuse the reclaimed materials from the manufacturing process. Our efforts have earned us the Green Seal environmental certification and ENERGY STAR® st andards. 4. Insulation – Fibrex gives higher insulating values to St. Charles, Missouri, energy efficient windows than other window materials. As a result, they keep your home comfortable in any season. 5. Beauty – We can mimic the look of your original windows’ sashes and frames to preserve the architectural beauty of your home. We can also create any kind of window shape using Fibrex frames. 6. Strong warranties – Unlike other window companies, we cover the frame, glass, and the installation. We offer 20 years warranty for glass, 2 years for installation, and 10 years for frames and other non-glass components. 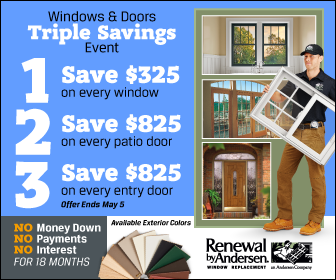 If you’re looking for superior windows installation in St. Charles, MO, and the nearby areas, you can trust Renewal by Andersen of St. Louis. Through our innovative materials, you can ensure you get the best windows for your home. Call us today at (314) 332-2364 for more information about our Fibrex frames. You can also schedule an in-home consultation when you fill out our contact form.